Ming Chow and Yu-liang Yeh (Ip Yuk-Leung) were the first 2 Chinese students to earn their doctorates from MIT. Both of them were Boxer Indemnity Scholars in the field of chemistry and received their degrees in the same year (1920). Whereas the two graduates shared a common academic interest, they pursued very different career paths – Chow devoted his life to academia in Shanghai where he helped transform his alma mater into the premier science & technology education institution in China, while Ip ran a successful import/export business in Hong Kong for almost half a century. Ming CHOW, Senior Class Portfolio 1914. Courtesy MIT Archives and Special Collections. A native of Taixing in the Jiangsu province, Chow was born into a family of Chinese doctors in 1888. He received his early education in Shanghai where he attended the preparatory schools affiliated with Nanyang Public School (南洋公學), the technology institute sponsored by the Chinese Ministry of Communications which was the predecessor of present-day Shanghai Jiao Tong University. In 1910, he received a Boxer Indemnity scholarship to study at MIT and earned his B.S. in chemistry in 1915 with the thesis - The Potential of Bismuth Electrodes. He received his M.S. the next year with the thesis - Potentials of Bismuth and Copper. His doctoral thesis was Electromotive Forces of Concentration Cells of KOH and on the Activities of Ions in Mixed Electrolytes and upon receiving his PhD from MIT in 1920, he returned to China where he first taught physics at the Baptist-run Shanghai College. Chow’s thesis which was published in the March 1920 issue of the Journal of the American Chemical Society. In 1921, Chow returned to his alma mater, then known as the Nanyang College of Chiao Tung (交通部南洋大學), where he would remain for close to half a century. He first served as a chemistry professor for 7 years alongside his MIT classmate Hsu Ming-Tsai (徐名材 BS 1913 MS 1914, Chemical Engineering) before starting the physics department with another MIT classmate Professor Chiu Wei-yu (裘维裕,BS 1918, MS 1920, Electrical Engineering) in 1928 when the school formally became Chiao Tung University (交通大學). Chow and Chiu were determined to raise the academic standards of Chiao Tung by emulating the teaching methods of their alma mater MIT, and to achieve this ambitious goal, Chow was placed in charge of developing and teaching physics experiments and building out the laboratories. Taking a page from MIT, Chow placed heavy emphasis on hands-on learning and the high degree of rigor in his courses in physics experiments (requirement for first- and second-year students) challenged his students to become better scientists through experimentation and accurate recording and analysis of the results. One of the courses he taught, “Precision of Measurements and Graphical Methods,” was based on the 1913 work of his MIT professor Harry Manley Goodwin (later the first Dean of Graduate Students at MIT) and was unique in China at the time. He also wrote an English textbook for physics experiments (comprised of 60 experiments) in 1930, which was used at Chiao Tung for decades. Chow was committed to teaching and allegedly turned down a lucrative government position from Chiang Kai-shek in 1936. When the puppet regime took over Chiao Tung in 1941 as the Japanese occupied Shanghai, Chow was among the six professors who resigned rather than collaborate with the enemy and only returned to the school after the War was over. In 1947, he was appointed Vice President of Academic Affairs of the University, but was forced to step down as he showed sympathy to the students who were protesting against the crumbling KMT regime. He chose to remain at the school after 1949 and even in his old age, he remained committed to teaching and innovation and invented a time measurement device that could measure down to the millisecond in 1955. His decades of running the physics experiment program at Chiao Tung helped to transform the school into the “MIT of the East” and provided a great foundation for many of his students such as the rocket scientist Tsien Hsueh-shen, MIT electrical engineering professor Lan-Jen Chu and computing pioneer Dr. An Wang, who broke new grounds in various areas of science in China and abroad. Ip went by the Mandarin pronunciation of his name, “Yeh Yu-liang,” during his years as a student in America but reverted back to the Cantonese pronunciation of his name, Ip Yuk-leung, after he moved back to Hong Kong. Born in May 1893 in Hong Kong to a family of merchants, Ip was a native of Sanshui in the Guangdong province. 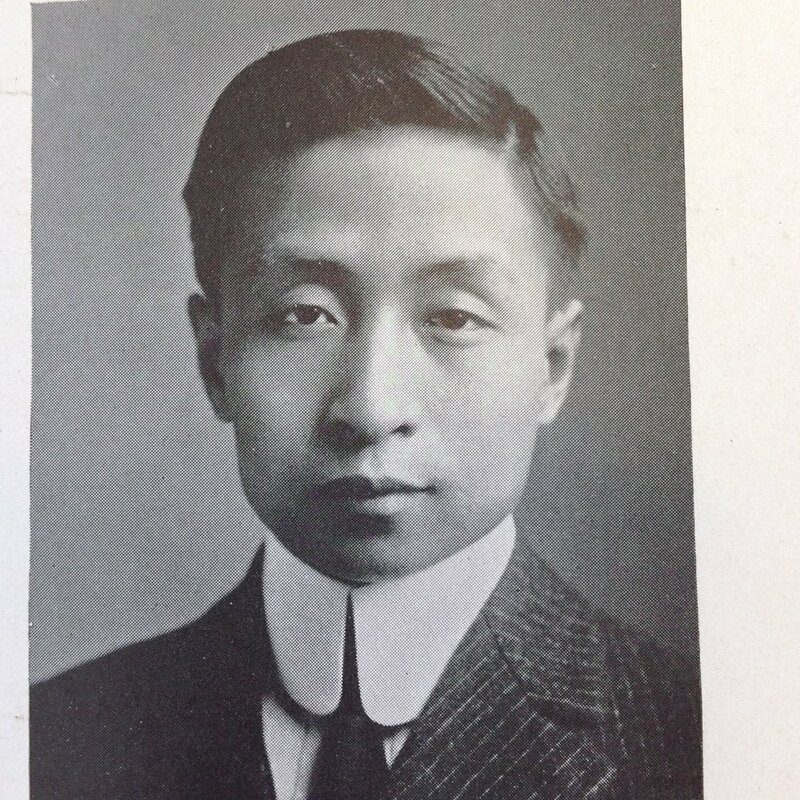 After graduation from Tsinghua in 1912, he entered Cornell to study chemistry where he received his B.A. in chemistry in 1916. The same year he wrote an article entitled “Hygiene and the Economy” for the Chinese periodical Science magazine and he also entered the PhD program at MIT. His doctoral thesis in 1920 was entitled Investigations on Liquid Junction Potentials, and on the Activities of Ions in Mixed Electrolytes, part of which was later published in the Journal of the American Chemical Society in 1921. He also co-authored another article entitled “The Potentials of Contact with Chloride Solutions” for the December 1921 edition of the Journal with Duncan A. MacInnes, a prominent electrochemist who was then an Assistant Professor at MIT and later known for his work at the Rockefeller Institute. After his graduation from MIT in 1920, Ip stayed in the US for 2 years during which he worked as a chemist for Du Pont at Carney’s Point. He returned to Hong Kong in 1922 to join the family business of Ip Tak & Co (協德洋行) as an assistant manager. Established in 1915, Ip Tak was a leading trading firm in Hong Kong which specialized in the import of metal products and the export of food products. Ip ran the firm for almost half a century as its chairman and general manager until its dissolution in 1970. Advertisement of Ip Tak & Co. Source: Official Guide for Shippers & Travellers to the Principal Ports of the World, Osaka Shosen Kaisha (Osaka Mercantile Steamship Company Limited), 1921. Although business took up most of Ip’s time, he remained involved in the promotion of the study of chemistry in China. In 1932, he was involved in the organization of the Canton chapter of the Chemical Society of China and served as a committee member of the Society’s foundation. On January 13, 1971, Ip passed away at the age of 77 in Hong Kong. He was survived by 3 sons, 4 daughters and 21 grandchildren. One of his sons-in-law was the orthopedic surgeon Sir Harry Fang Sin-yang (1923-2009), who was known as the father of rehabilitation in Asia and served on Hong Kong’s Legislative and Executive Councils. Trademarks for imported paper filed by Ip Tak & Co in 1931. Source: HK Government Report.